Several factors contributed to the rejection of the agreement. In the month before the referendum, the government ran a limited information campaign, banking on opinion polls that indicated Colombians favored a negotiated peace over war. However, other polls showed that a big majority of the people wanted punitive justice for the FARC and no future political participation by the rebel group. The opposition to the agreement, led by ex-president Alvaro Uribe, knowingly pushed those arguments and exploited the limited knowledge that Colombians had about the content of the agreement. Geographically, the center of the country was against the agreement, with the notable exception of Bogotá, the capital city. In contrast, the peripheral areas, where most of the victims of the armed conflict live and where violence remains a reality, voted in favor of the accords. The voter abstention rate of 62.6% was historically high, primarily because 1) people in urban areas did not see a direct gain from participating in the referendum; 2) Hurricane Matthew complicated voter turnouts in the Caribbean coastal regions; and 3) there was a lack of information about the highly technical and extremely long peace agreement, which spanned 297 pages. Since September 2014, several pre-agreements, like political participation and rural reform, were publically available. However, they were not properly explained to the Colombian people, nor was there a process to address their concerns. Indeed, there were no information campaigns oriented towards the community level. While a few regional conferences were organized during the last six months of the negotiations, key local-level stakeholders were not engaged. Instead, familiar cronyism prevailed and concentrated on the existing political machinery, which in turn focused on caudillos (local elite politicians). Additionally, direct civil society participation was not possible because of the top-down approach of the mediation process in Cuba. The process was geographically removed and involved government elites and FARC leaders. As a result, most Colombians felt ill informed about the advancing negotiations and even questioned whether the peace efforts would bear any fruit. The notable exception to this mandated isolation was the invitation of victims’ delegations to enrich the discussions on the transitional justice model. Moreover, the capacity of the opposition, led by Uribe, to mobilize socially conservative parts of society was underestimated. 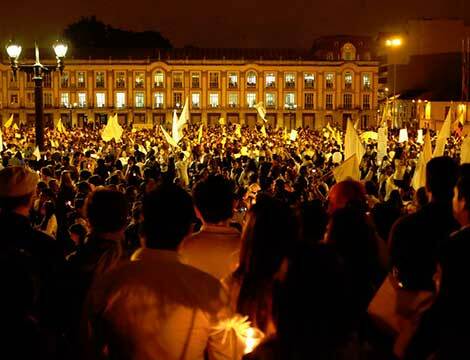 There were attempts by the Colombian government to include the political opposition in the peace process, but the latter declined several of the government’s invitation to participate in the negotiations. Their absence led to an exclusion of their perspective in the talks, thereby increasing their opposition to the final outcome. The reaction of the international community to the failure of the referendum was swift and manifold. Several world leaders, among them UN Secretary-General Ban Ki-moon, expressed their unwavering support for the peace process. President Juan Manuel Santos, politically weakened by the referendum’s results, received critical support by winning the Nobel Peace Prize and continued to negotiate with the FARC and the political opposition. Given the apparent deep divisions in Colombia, Santos and other key actors understood the importance of a nationwide dialogue, which is why the president subsequently visited different parts of the country, listened to the people’s concerns and tried to explain the accords. Another premise for dialogue is to recognize the differences of the various actors. At the top level of politics, the result of the referendum pushed the right wing political opposition to the forefront. Their enhanced leverage and arguably self-interested desire to water down several key provisions of the peace agreement considerably limited the options of President Santos. The Government was thus forced to balance between what was reached in Havana and the internal political pressure. Influential mid-level actors can help in the peace process. An example are the 380 Colombian businessmen who previously signed a letter to offer their good services to facilitate further dialogue, and who want both the government and the opposition to focus on the national interest instead of personal gain. Other actors could play a similar role, such as the Catholic Church and national NGOs, even though it is evangelical churches which successfully lobbied for fewer gender-specific provisions in the new peace agreement. On the grassroots level, some parts of civil society and academia, mainly in the bigger cities, started to discuss the peace agreement shortly before the referendum. This broad engagement has increased post-referendum and the conversation has moved to the streets. Students and young people, organized on Facebook as “Paz a la Calle”, are demanding peace and are explaining the accords in public spaces. While this informal movement came too late for the referendum, their continued support for an adjusted peace agreement can be key to put pressure on all actors involved to find a national solution. The government has promoted “territorial peace” as the mechanism to implement the accords. One way to tackle the communications issue is to engage in regional dialogues that include community leaders and build on the emerging students movements for peace. By relying on this approach, Colombian society can develop a true understanding of what territorial peace means, which has thus far been criticized as being too abstract. Moreover, it gives voice to the grassroots level and opens up a forum for discussions about what the end of the armed conflict implies and the opportunities it generates. Successfully transporting the message of peace to the majority of Colombians who have not voted will be one of the major challenges ahead. The Colombian constitution allows for town hall meetings (so-called cabildos abiertos). This grants citizens’ participation and a more horizontal conversation that is not limited to the elites and includes people from all sectors of society. Directly following the referendum, the FARC recommitted itself to the peace process and the bilateral ceasefire was prolonged until 31 December 2016. Then, after the complaints of the “no camp” were taken into account, the peace talks resumed promptly and resulted in an earlier-than-expected new agreement which was announced on 13 November 2016. The new agreement takes into account the crucial points previously raised by the opposition and includes major changes that relate to transitional justice and political participation, while carefully trying not to destroy the overall character and balance of the text. After an initial reading, the opposition to the first agreement rejected the updated document, stating that the changes were not substantive enough. Contrary to the first agreement, the renewed text is likely to be submitted for approval to the Colombian Congress only, without also being submitted to a popular referendum. Yet even without a new referendum, the rejection of the first agreement and the subsequent discussion showed the importance for broad inclusion in the peace process and the need for a continued broad engagement of Colombia’s society. The main lesson to be learned from Colombia is that getting broad support for a peace agreement, notably when subjecting it to a referendum, requires the inclusion of the political opposition as well as an active and inclusive national dialogue. International observers perceived that Colombians were missing an opportunity by rejecting the agreement. However, the results provided a necessary space for a necessary dialogue that could increase the chance of successfully implementing the accords in a generally very polarized society. Only when open and lengthy discussions are able to take place can the doubts and fears of people can be addressed. A national dialogue that manages to engage people at all levels will eventually allow for a successful implementation of the agreement. Johannes Langer is teaching international relations at Universidad de San Buenaventura, sede Bogotá and is leading a research project on the impact of truth commissions. Eliana Jimeno is a consultant on questions of transitional justice and historical memory based in Bogotá, Colombia. *The authors are not members of the CSS and are writing in their personal capacity. The opinions expressed here do not necessarily reflect the position of the ETH CSS or its partners.